Hello again! As I mentioned in my previous post about 2 days ago, I've been gone and missing so I hope nobody thinks I'm dead. If you did at any moment WISH that I was, well then I think you should go die too go get your head checked because that's pretty mental. And as promised, I've got post after post that should follow after one another...provided I'm not drained and splattered on my bed after dinner. 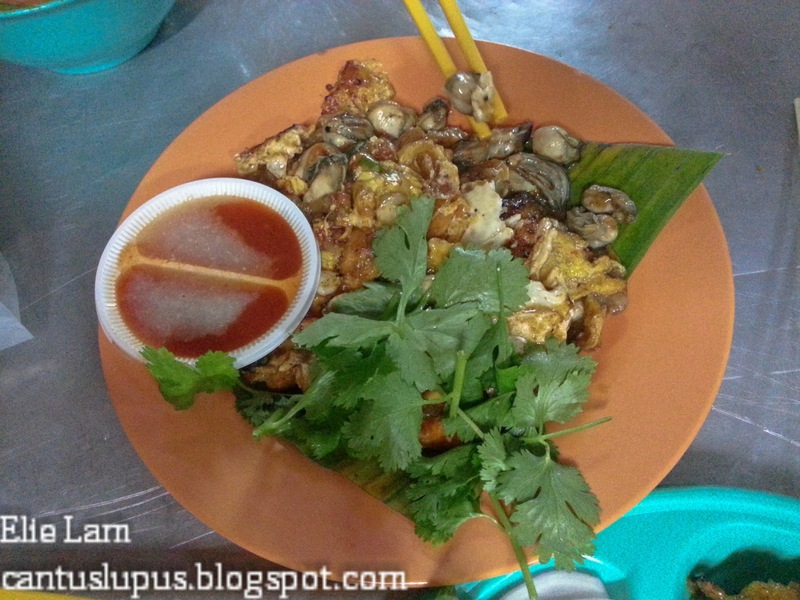 So in this post, it's all about going around Penang for nothing but food, food and food. Sure, Penang is a historical city with loads to see and much to discover but sometimes there's more than just adventures in life. Do you eat to live or live to eat? To me, it's a little of both to balance along with a whole lot to boot. And I shall begin. I warn you in advance though, if you're hungry, lay off this post and head over to the next. You're much safer off that way. And then when you're well fed and bored, you can come back to make yourself hungry again. At only RM 0.60 a stick, this pork satay is to die for if you're a pork lover and the chewy texture to it is really amazing. More often than not, there's not many to go around and the vendor seems to enjoy torturing tempting us just that way; selling only a limited amount per day. Found in Keat Seng Restaurant, Air Itam. Only at night from 7pm on. O' Chien or Fried Oyster found in Keat Seng Restaurant, Air Itam for only RM 7 at this size. Featuring huge oysters, aromatic eggs and aromatic parsley to pair off with, this whole plate of O' Chien is a must try if you're at Keat Seng. This is not your regular O' Chien place that gets you feeling disgusted with the taste of flour, flour and nothing but flour but instead feeds you with chomps after chomps of fresh oyster with eggs. Dip it along with the sauce and you'll be off to oyster heaven! Note that the morning delicacies in Keat Seng Restaurant aren't as good as the night stalls so it's always best to go elsewhere for your morning devouring. The curry mee at night is also really good but I'm not a huge fan of curry mee...so yeah. 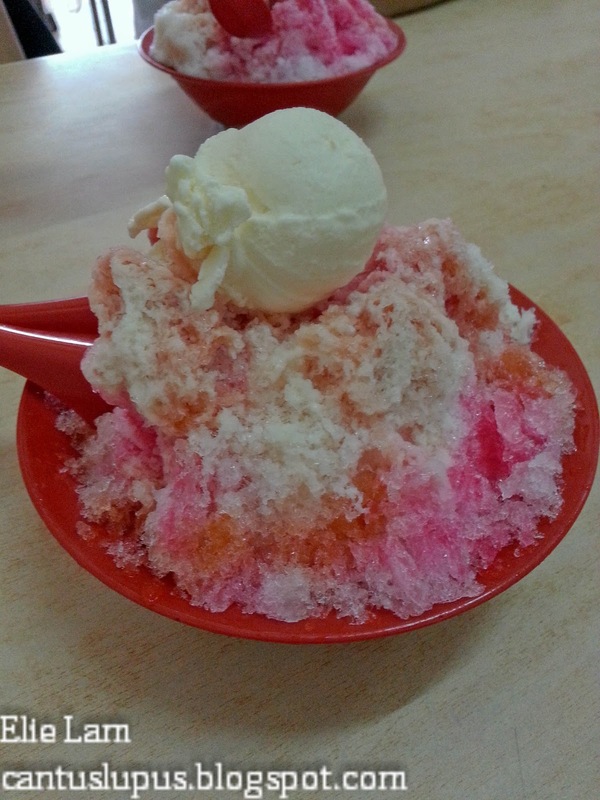 It's just about RM 3 per bowl so why not give it a go if you're there anyway? Unfortunately for me, my family only got to Penang around 1pm and spent our whole afternoon cleaning, moping and preparing the house after we have left it following the passing of my grandfather. And so our first day was just left with dinner. The very next day, my parents, brother and his girlfriend along with myself decided to get into town and have amazing food to fill our bellies. You're in Penang, what else can you do but eat anyway, right? Let the trip begin. I swear we ate the most on this day. 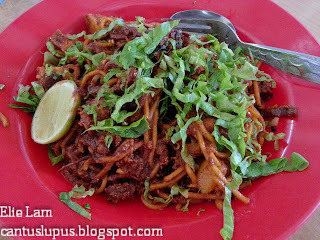 Famous Mee Goreng at Seng Lee Coffeeshop, Bangkok Lane, Pulau Tikus, Penang. You may have heard of this little store inside of the corner coffeeshop near the Pulau Tikus Burmese temple. They have been featured in newspapers, food magazines and even food shows from abroad! With LOADS of squids, tofu, vegetables and much more to go along with this plate of heaven, it's another MUST HAVE item if you're down in Penang. 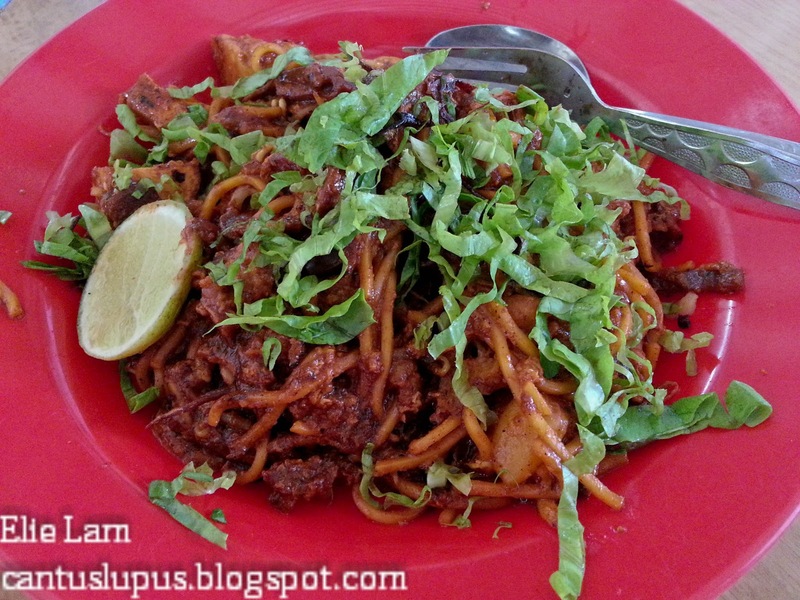 If you're extra curious, check out how they make ONE plate of this delicious Mee Goreng! I love how the uncle is so sporting and showed me the plates of Mee Goreng at the end. We ordered two plates to share since there were 5 of us and to be honest, I wish there was more to go around! 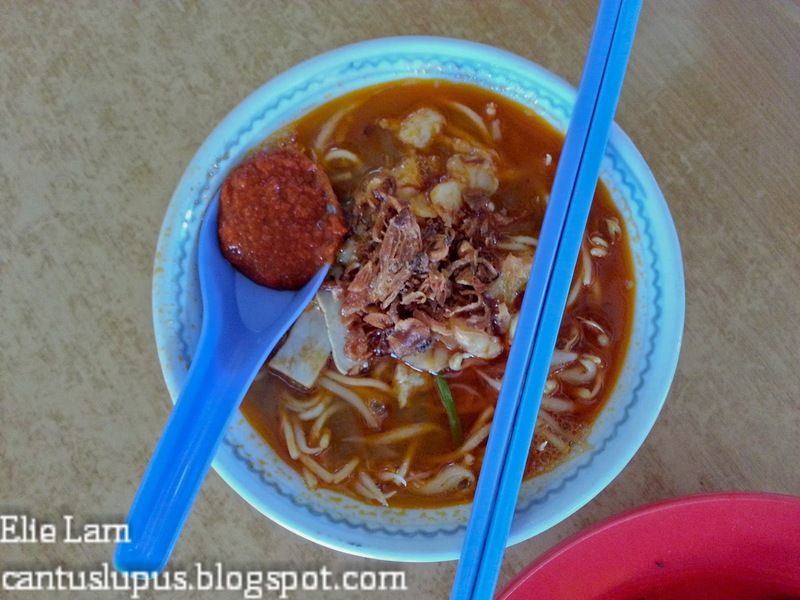 Famous Hokkien Mee at Seng Lee Coffeeshop, Bangkok Lane, Pulau Tikus, Penang. Reportedly, this bowl of Hokkien Mee has won numerous awards; ultimately clinching the award for being the best Hokkien Mee around Penang in a competition. 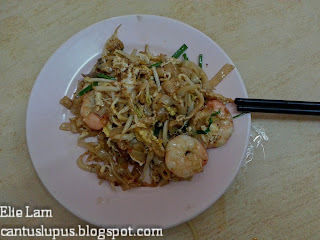 Personally, it wasn't exactly THE best bowl of Hokkien Mee but that's fairly subjective as per person. Having Mee Goreng and some Hokkien Mee in our systems, we thought we'd go all out and hunt for the wall murals by Ernest Zhacarevic, the young Lithuania-born artist who has been drawing on walls all around Penang as part of the Georgetown Festival 2012 attraction but...more on that later. Eventually after much searching for numerous wall murals, we headed on for more food! Muah Chee that I had while hunting for the wall murals all around Georgetown. Only RM 3 for a packet as big as this. 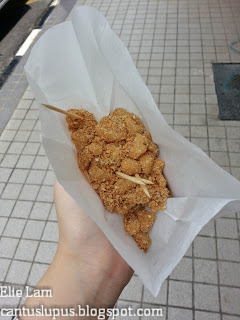 The taste of the peanuts coating the warm Muah Chee was really good. Unfortunately, you can only get it if you're lucky enough to see the uncle selling it on a motorcycle. Yum! 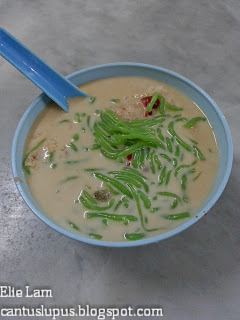 Famous Penang Road Cendol at RM 2 per bowl / RM 2.50 if you opt to have it inside the coffeeshop. Ah yes. Who could ever forget the famous Penang Road Cendol that is always overflowing with people. A huge contrast to their not-so-fierce competitor opposite, this bowl of cendol will always be a great choice to cool yourself down; especially if you've just gone around the whole Georgetown in search of walls. You'd probably never miss it or have to figure out which is the right stall because the staffs have uniforms that comes in green and white with the words "Teochew Cendol" printed on them. 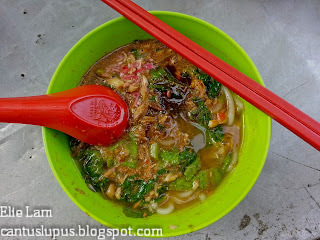 Note that if you're standing or crouching OR if you're really lucky to find a seat by the roadside it is RM 2 a bowl but if you decide to order for it to be sent to you while you have some food in the coffeeshop next to it, there's a RM 0.50 surcharge making it RM 2.50 a bowl. 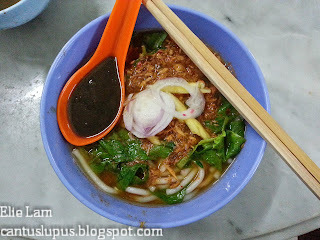 Famous Penang Road Assam Laksa. At RM 3.50 per bowl, this laksa is nothing but a let down. Supposedly extremely famous for its abundance in flavor and great taste, there was nothing but sweetness and a soup that is plain and bland. I could hardly find fish pieces as you would expect to find in an authentic bowl of laksa soup and the portion is fairly small. All the same, it has been featured in the newspapers but it's really nothing to shout about. 2 days in and no good laksa to be found. It gets sad, really. We had to call it a day after the Penang Road trip for we had a dinner date with some relatives back there. But the adventure didn't stop there. I had wanted to go do some shopping the very next so we decided to head for Prangin Mall, Georgetown. If you're wondering where that is, just head to Komtar and you'll find this little mall nestled right next to it. You'll find shoes, bags, clothes and much more just as you head in. It's just like a Sungei Wang...except its in Penang. Before going in, we definitely needed fuel for war! Much like a regular ABC, this Ang Dao Seng seemed like the appropriate thing to serve on a really hot day or when someone has a sore throat. It was good but it could have been better. 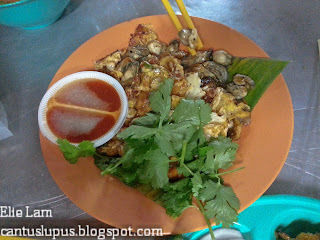 Char Koay Teow at Kafe Heng Huat, Lorong Selamat, Penang. This is just about the most absurdly priced and ridiculous Char Koay Teow I've had for so long that I've been in Penang. Supposedly extremely delicious, this tiny plate costs RM 8 and requires an average 15 minute wait. Much to its hype, it didn't taste good at all and even the Char Koay Teow in Yong Len Coffeeshop, Taman Tun Dr. Ismail tasted better. Urgh! I felt so cheated on behalf of my parents. And a fun fact about this particular Char Koay Teow stall at Kafe Heng Huat, Lorong Selamat: Apparently the aunty who wears a red chef beret once told off a customer who complained about her Char Koay Teow being too expensive. To be honest, it wasn't just a rumor. I noticed that she walked into the coffeeshop midway through frying holding her long handled ladle and asking her staff which customer complained about the price. Don't look at me, we didn't get our food at that time yet but I later found that it was the table a few feet away from us. The crowd still goes there but I'm not entirely sure if it's to see if the rumor of her telling off the customer is real or to taste and judge for themselves whether or not it is as good as it is priced at. Eventually after eating this hefty priced Char Koay Teow, we decided to walk it off at Prangin Mall as we planned. It truly is a Sungei Wang placed miles and miles away with the array of clothes, shoes and little knick knacks that you see all over. I wanted the tote bag for RM 10 but I remembered about how I have one too many bags and decided not to get it. I have to stop going on shopping trips, really. When that was done and I was happy with my new shoes and 2 new tops, we thought of going back to where we really belong for lunch; Air Itam. Ark Bak Kuey Teow Th'ng or duck's meat kuey teow soup! Ha! I loved how this tasted. 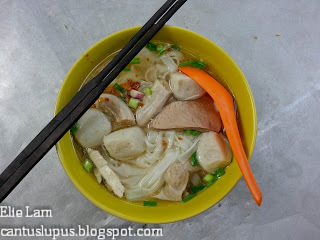 Located just opposite at the little alley of Asia Cafe, Air Itam, Penang, the soup to this bowl of Ark Bak Kuey Teow Th'ng was not only aromatic but was also a complete abundance of tastes. Although the kuey teow was not as smooth as the ones you find in Ipoh, this bowl definitely clinch the winner as the next best thing you could ever find to a plain bowl of Kuey Teow Soup. They are only open from 1PM until they finish (which approximately 4PM on a regular day or earlier on a weekend) but are closed on Tuesdays unless it is a public holiday. FINALLY. 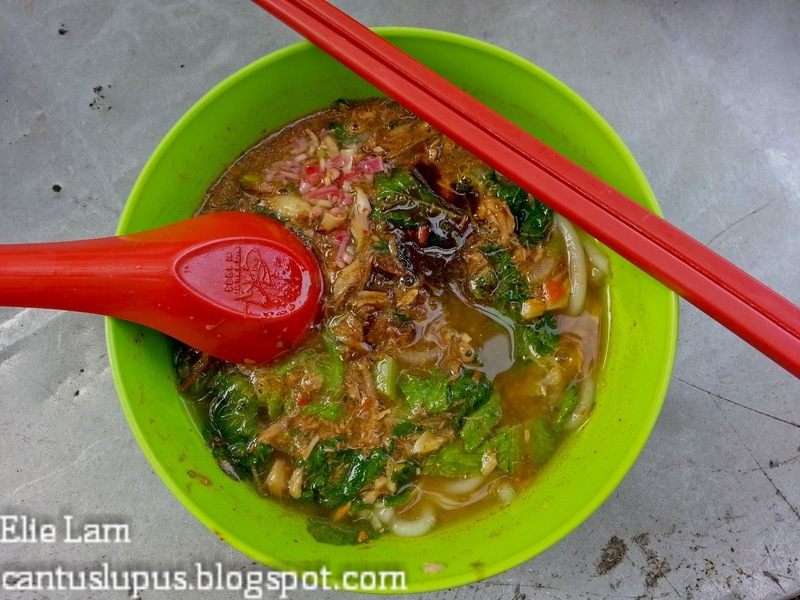 Assam Laksa! And not just Assam Laksa. GOOD Assam Laksa. All the same, this bowl of Assam Laksa was purchased just opposite of the little alley of Asia Cafe, Air Itam, Penang and is definitely the best assam laksa I've tasted in my 3 days of staying in Penang again. There was loads of fish bits in the soup after I finished my noodles and I could have sworn if my stomach had a little more space, I'd drink up all the soup too! The aroma hits your senses the very moment the bowl comes to you and the taste is a dance of its own on your tongue. Truly the assam laksa everyone should taste if this is what they are looking for. Authenticity, fair pricing and good taste. All for only RM 4! Remember, they are open from 1PM until they finish just the same as the Ark Bak Kuey Teow Th'ng so you have to remember to rush there if you really want some good food. So THAT concludes whatever I've eaten in Penang for 3 days. 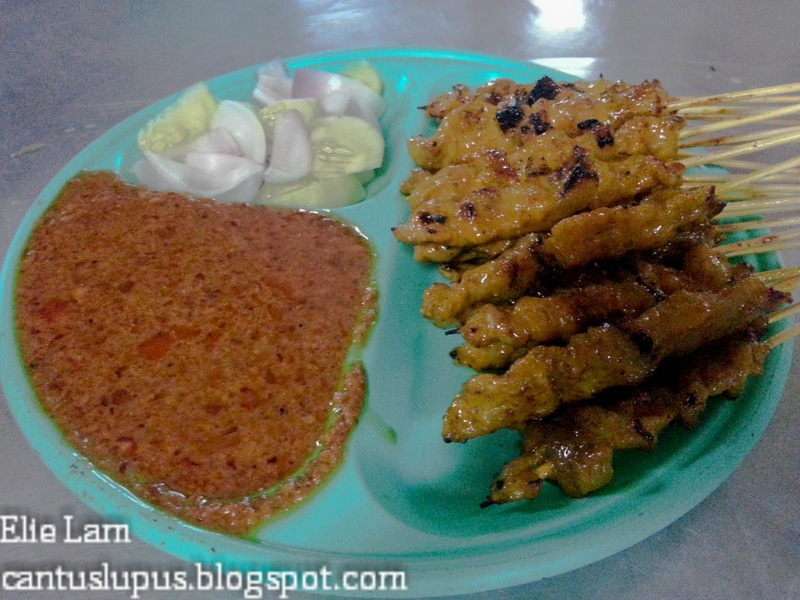 Note that I repeated my food choices at night with the pork satay and o' chien because it's just a walking distance from where we stay and it's just that good! Oh and I really have to mention about this amazing thing that the Penang-ites have managed to do! 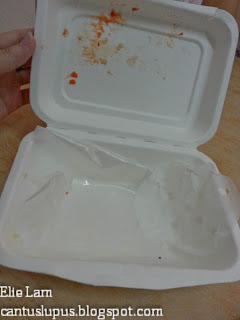 Penang does NOT allow polystyrene boxes for take outs anymore! 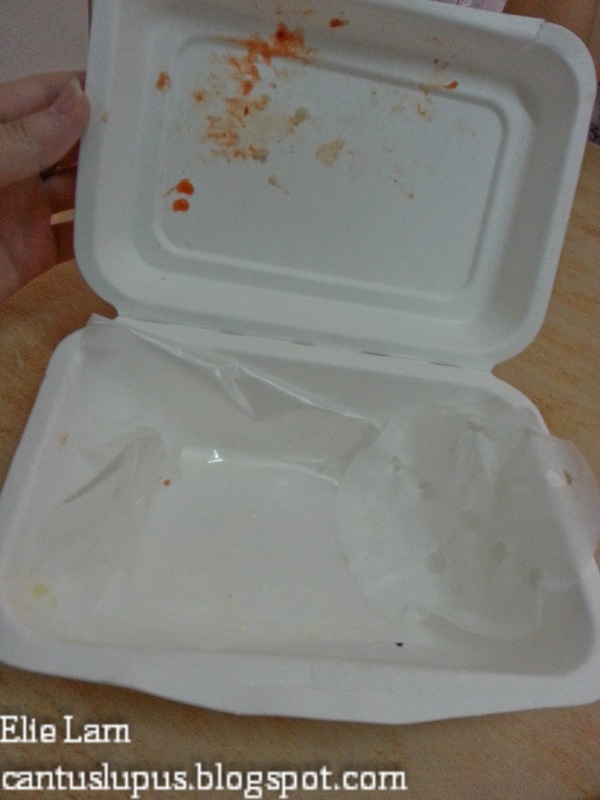 What you see here is actually a take-away box made entirely out of paper. (Correct me if I'm wrong.) It is sturdy, clean and gives a very firm grip when we hold on it to. 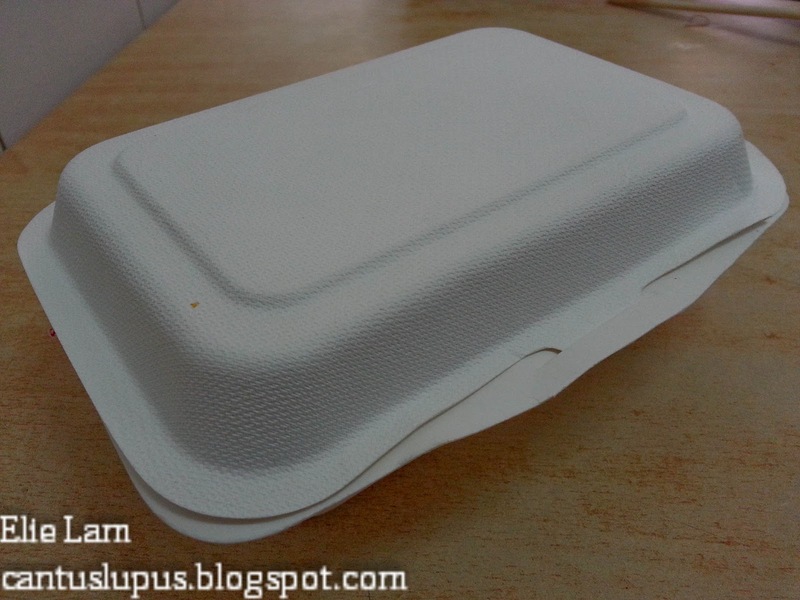 Not only is it not harmful to the environment, it's also safe for our own health and is much more sturdy compared to regular polystyrene boxes! I think it's an amazing move by the Penang government to ban the use of polystyrene boxes! A great, big kudos to them! And that's just it for the food version of Penang. It's been an extremely fun and fat trip for me. I have yet to step on the weighing scale because I am just that afraid of my ballooning weight. Maybe it's time to exercise. After I sleep. *Snores real loud* I'll get posting on the other side to Penang that I ventured into...when I wake up. Happy eating. Or salivating.